Is It Time to Transcend the ‘Urban-Suburban’ Divide? The city was innately virtuous because it had different kinds of people and more museums and a Chinatown. And if you were not willing to go through the occasional weapons inspection to win access to all of that, then clearly your priorities were wrong... I was sure the suburbs could permanently mar the very personality and character of everyone who lived there. Given this deep-seated prejudice, it’s not surprising that she found herself going to great lengths to argue that Alexandria — an archetypal suburb — could not possibly be one. She concludes that “to live in the city is to take a kind of risk, while to live in suburbia is to avoid it.” Sadly, this is an unsatisfying answer to a very important question. After all, the shape and definition of our urban fabric has implications that go far beyond 24-hour availability of Thai takeout, or even what one’s neighbors look like. Where and how we live strikes at the heart of the most pressing crises that face the world — from resource depletion and sustainability, to the nature and shape of our economy, to our physical and emotional health. If we can’t even figure out what defines a city, how can we hope to address these challenges? Eleven years, one wife and three children later, however, I found my life bursting through seams of a first-floor, 950 square-foot apartment in Washington Heights — and I realized it was time for a change. My wife and I both worried about moving to the suburbs, but we did it anyway. Today we live in a nice house on a quiet street in Tarrytown, N.Y. — a place that is, instructively, entirely unlike either Littleton or New York City. In her oft-quoted 1961 classic, “The Death and Life of Great American Cities,” Jane Jacobs famously slammed the urban planning trends that she believed were sucking the soul and health out of cities. Since then, the book has become a bible for anti-suburban crusaders. A great many of the pernicious trends Jacobs observed are today defining characteristics of what we think of as suburban: monolithic, single-use zoning, the favoring of cars over pedestrians or transit, the elimination and devolution of public space. Jacobs, however, was primarily concerned with cities, not suburbia, and was equally appalled by quintessentially urban trends of the 20th century, such as the massive public housing projects and highway plans that butchered vital neighborhoods. To those of us who love cities, this assessment makes intuitive sense. But is it the whole story? In his scathing critique of Jacobs’s book, her would-be mentor-turned-critic Lewis Mumford accused her of muddling up the real nature of what is urban and what she loves about it. According to Mumford, the very things that Jacobs most praises about Greenwich Village — face-to-face contact, a sense of belonging — rest not “on a metropolitan dynamism, but on continuity and stability, the special virtues of the village.” In other words, if these special places exist in cities, it’s not because of the urban forces that surround them, but in spite of them. Unlike Jacobs, Mumford had a deep ambivalence about urban life, and a particular hatred for the 20th century gigantism that was turning “metropolis” into “necropolis.” But if there was one thing Mumford hated more than cities, it was the dehumanizing sprawl that he saw rapidly rising around them. In his prescient 1958 essay, “The Highway and the City,” he attacked the recently created Interstate Highway System, predicting that it would lead to “a tomb of concrete roads and ramps covering the dead corpse of a city.” Needless to say, if he could see many of the cities Americans now live in, he would not be surprised. 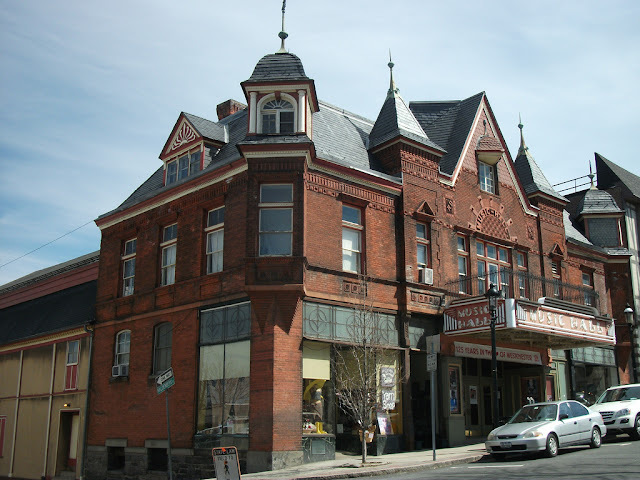 Like Alexandria, Tarrytown has history on its side. Although it doesn’t predate the first settlements of New York, it’s old enough to have already been historic when its most famous resident, Washington Irving, described it in the opening of “The Legend of Sleepy Hollow.” Like Alexandria, Tarrytown is “no post 1950s auto-oriented subdivision.” It has charm and good restaurants, the vast majority of which are locally owned (no Applebee’s). For most of us who live within the village, the daily needs of life (and the Metro North train station) are in easy walking distance. Yet, we are suburbanites. No one would confuse this place with New York City. The one thing that Tarrytown and a place like Greenwich Village share is a respect for the human scale. It’s not just that you can walk here — it’s that you want to. Neither of these places could be further away from a big-box land filled with strip malls and burdened with parking lots, or from the chokingly sterile concrete plazas and climate-controlled glass skyscrapers of a place like Houston. And neither place is comparable to the increasingly distressed, distant exurbs that have fallen victim to the housing bubble and collapse. 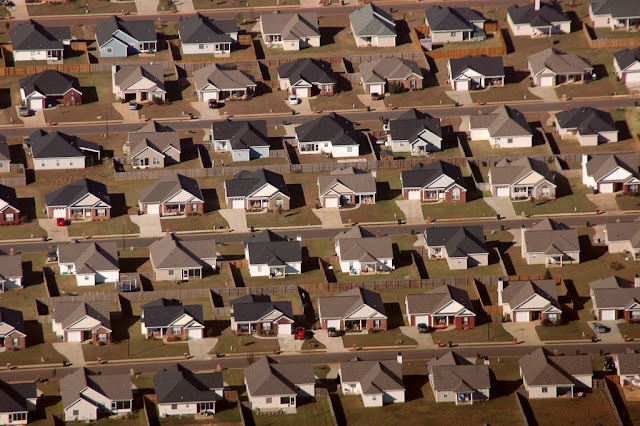 There are other reasons to question America’s old ideas about the suburban-urban divide. Today’s suburbia is far more ethnically and racially diverse than in the past. At the same time, in contrast to old stereotypes contrasting urban poverty to suburban affluence, more American suburbanites now live in poverty than urban or rural residents, according to a 2011 Brookings study. The image of suburbia as the sole province of single-family homes is no longer true, either. Since 1970, suburban multifamily housing has been the fastest growing real estate market in the country, accounting for more than one in four housing units today, according to the Journal of Architecture and Planning Research. Call it the post-suburban world. In reality, both Jacobs and Mumford were right. They illustrated how superficial distinctions between city and suburb are facile at best and dangerously misleading at worst. Most of Jacobs’s prescriptions for what ails modern urban life apply as well to the suburbs, as the New Urbanists and others have pointed out. But Mumford’s central point holds true as well: One cannot address the problems of the city without understanding the larger economic, socio-political and technological forces that create the conditions for both suburban sprawl and urban decay. In other words, most of the diagnoses and prescriptions that Mumford and Jacobs describe apply equally to urban and suburban places. Maybe it’s time to stop worrying so much about the symbolic meaning of general urban categories and to start looking more closely at the specific characteristics of particular places, how they function, and what makes them work the way they do — applying both a finer-grained and wider-angled analysis to understand how we got here and how to move forward. Lakis Polycarpou is a journalist and ecological designer who is deeply engaged with the paradox of sustainable urban living. He is a partner in two ecological design collectives, Emergent Designs and Real Returns. Great post! I agree that understanding the concept of place is more important than distinguishing between city and suburb, and that many solutions to local and global problems transcend this divide. I also like the way Emily Badger identifies a fundamental difference in the variety of people and events found in cities as central points of attraction. That doesn't necessarily make cities better or worse than suburbs from a place-making perspective (and different places meet different needs at different times), but good restaurants, multi-unit housing, poverty, art movies, walkable neighborhoods and diversity aren't substitutes for central exchange. Limiting that (which Andrew Meyers associates with Mumford in "Invisible Cities: Lewis Mumford, Thomas Adams, and the Invention of the Regional City, 1925-1929 [PDF]") is fortunately not likely to happen. Urban centrality — unlike the Internet — makes it physically unavoidable to encounter the unknown on a daily basis. This has fostered innovation and tolerance for centuries. While there's nothing wrong with living at a peaceful remove from this concentrated energy (and its unattractive aspects like stress, pollution, lack of space), it's important to not forget the cosmopolitan benefits of urban centers where people from around the city, suburbs, country and world congregate. That said, it would be so good to see less polarization between cities and suburbs — as well as equally high living conditions and a lot fewer cars — without homogeneity. More cooperation between urban, suburban and rural areas would also be ideal. Maybe the names urban and suburban aren't even necessary. Suburban even sounds pejorative. Yes, I think it's time to transcend the divide and just think in terms of unique places, as long as we don't loose the concept of a center. Thanks for your comments Peter! Regarding urban centrality - I wonder at what scale this is necessary? Could a well-designed city of say 50,000 people, surrounded by distinct, walkable villages ("human-scale suburbs") serve the same function as a mega-city? In other words, is the megaopolis necessary for the values of urbanism? Or does it, paradoxically, work against those very values? (I am not sure about the answer to this question). One of the things Mumford advocated was regionalism; if I read him right, I think what he wanted was to preserve the vitality and tolerance of cities without the degeneration (crime, poverty, dramatic class differences, thoughtless industrialization leading to loss of autonomy, etc.) that he saw as endemic to the rapidly growing cities of his lifetime. I would say that centrality isn't dependent on scale. I think a smaller center can serve the same basic purposes as a massive one as long as there's enough space for anyone who feels inclined to gather in and around it. Higher population usually brings more dynamism, options, marvels, etc, but this is relative, and a smaller center can play that role for a smaller constellation of distinct, walkable villages. The only thing that doesn't seem possible, or even preferable in my opinion, is trying to limit population size. Freedom to decide where to live, within the parameters of democratic laws to prevent things like housing developments prone to landslides and environmentally harmful sprawl, is so important. And I think urban/suburban/rural problems are rooted more in governance and resource allocation than population size. Personally, I prefer living in mega-cities, the more people the better, but I would never argue that everyone should live in them. We should work with the places where people naturally decide to live, within some collectively determined limits, instead of setting norms for the size of cities. When I was reading Mumford fairly intensively a few years ago, I was left with a more sympathetic view of him, Stein and the RPAA than the one presented by Meyer. At the same time, I don't think trying to re-engineer where people live and work is a good idea, and Mumford's regionalism derived from Howard and Geddes seems to require that. I think we should manage cities democratically based on where people choose to live and work because, as you point out very well in this article, problems of crime, poverty, pollution, etc can just as likely afflict badly managed village settlements as metropoles. Hm - I agree that centralized, top-town approaches to limiting urban size are often ill-conceived, and it certainly seems that Mumford advocated this approach in his regional planning phase. At the same time, I think a case can be made over the 20th century a great many people were pushed rather than pulled to live in huge cities - as for example, a raft of government and policies and subsidies made smaller scale farming difficult or impossible, forcing people to move to cities for work. Or the widespread destruction of village life in favor of the oft-mentioned mall/big-box culture that that seems to offer no sane alternative to living large cities. In other words, we are already engaged in a silent re-engineering in favor of large agglomerations. Just for the sake of debate, I'm curious about your statement that you prefer living in mega-cities, the more people the better. As an urban lover, do you really mean that you would prefer to live in Houston, TX (pop. 2.3 million) or Phoenix (1.4 m) over smaller cities like Austin, Portland, or any of many smaller European cities I could mention? :) Interesting question. It's hard to say, as I've never been to Austin, Houston or Phoenix, but Portland seemed like a wonderful, very healthy place to live. I also enjoyed living in Ithaca, NY, but if I could choose, I think I would go with a place where there are millions of people in a relatively small area. I like the anonymity, and the way there's always something surprising around the corner. I agree that walkable communities are much better than places that require a car. Having a car is something I'll never miss, and experiencing cities as a walker or cyclist makes it so clear how dominating and dangerous they are. yes, incentives in the form of good public transport links could help support a decentralization that's better for the environment, but who's going to pay for it? and doesn't that still mean more landscape covered with construction and wasteful infrastructural expansion? can't large agglomerations also be attractive? Nice post. BTW it got picked up by Planetizen, so that should draw some non-Polis regulars over here. I agree that in the US context, the term "suburb" has almost lost all meaning. If a rapidly-growing (until recently at least) New York exurb in eastern PA (I'm not from the area, so I don't know the specific names of those towns) is referred to as a "suburb," and so is, say, (diverse, dense and built-out) Mt. Vernon, then does the term have any meaning whatsoever other than "a community in a metropolitan region that is not located within the boundaries of the area's designated central city?" Please, let's all have more discussions like this! We need it. The old categories aren't helpful anymore, and we need to figure out how to move forward. Seems like there's an economic component missing from this article. Aren't suburbs still places where a large percentage of residents must commute to cities to find employment?